a 2007 custom Dragster "Drakko". It has a Chrysler 440 cid wedge engine in it along with a 250 horse power NOS system. 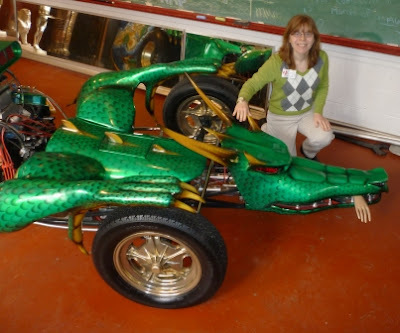 Another example of modern car art. It breathes smoke and fire out of its mouth and the eyes light up red. Good thing I went into his lair when he was "asleep." 'Til next time have a totally amazing day. Hello! I helped my father make Drakko! We had to sell him a few years ago.. I have been searching for him ever since. I am glad to finally see pics of him. =) Hope you enjoyed yourself. Wow what a sight to see. I am so happy that Drakko is still in one piece. We were heartbroken to have to sell him. We put many long hours into his creation. His daughters, son in law and I were proud to have been part of such an amazing piece of work. Ken Peterson the creator, sculptor, painter etc...passed away this year but would be proud to know his car made it to the museum. Wow, Its nice to meet you both. I'm sorry for your loss. 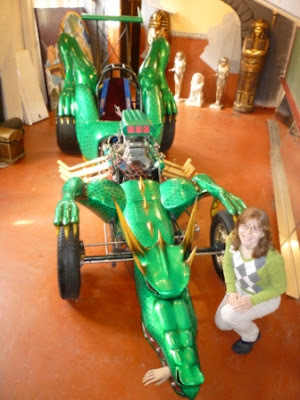 The car did make it to the Museum and has its own "dragon's lair" complete with a to do list. I'll take a picture of its of the lair if you want while at the Museum today and post them for you. :) I did enjoy myself. Its an amazing piece of art. I would love to hear stories about making it if you have any to share. I would love to see them. We are planning on taking a family trip up there to see him. =) Thank you Amber. I know that I have some more pictures that I took a couple of years ago, but I'm still searching for them. Have a safe journey up when you come up. 1959 Ford Skyliner - A Convertible Hardtop?